One Unified Platform For Fleet Management, Asset Tracking, Temperature Monitoring, ELD Compliance & Driver Safety to Streamline Your Business & Lower Your Costs. The Wireless Links product portfolio includes a broad set of vehicle GPS fleet management software and tools within our solution pillars. From vehicle tracking to ELD systems and everything in between, Wireless Links offers benefits that other, less innovative companies cannot match. Simply select the desired solution to explore more and scroll down to learn more about the platform’s extensive features and benefits. Powered by Google Maps and packaged with our industry-leading hardware solutions, we provide the industry’s most advanced fleet management and asset tracking platform. Easy for you to use and navigate, providing you with real-time visibility and operational control of your fleet activity. With a wide-range of integrated solutions for Fleet management, temperature monitoring, driver safety and more, we offer one unified platform to streamline your business and lower costs. 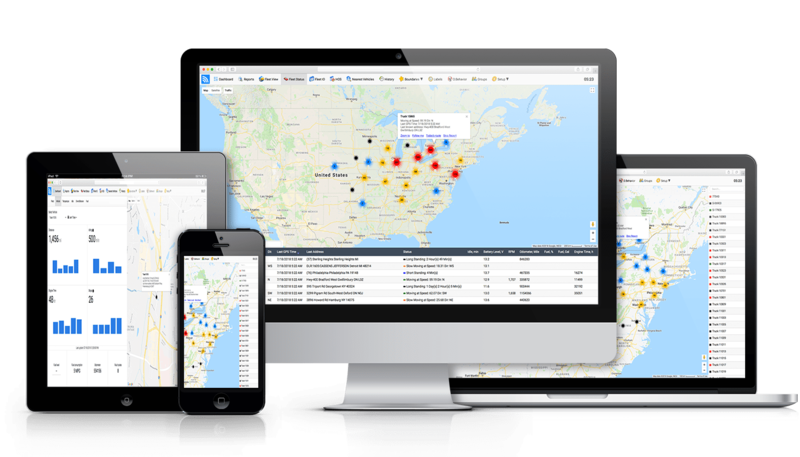 At one glance, see key trends by teams, department or across your entire fleet. View real-time activity and current status across all your vehicles and assets, and remove map related chaos with smart clustering. Fleet.Net is a cloud based solution, enabling you to stay in control whether in the field, at home or in the office. With Fleet.Net, you have real-time view of every angle of your fleet activity including idle time, last location, current status, battery level, odometer, speed and speed limit and driver ID. When it comes to quality and serviceability – we depend on no one. Unlike most of our competitors, Wireless Links designs, develops and owns 100% of the technology powering Fleet.Net, DriverLog ELD and the Piccolo Platform of Telematics Devices. Streamline your fleet day to day and optimize dispatching with hours of service availability status operations and simplify FMCSA Compliance with our DriverLog ELD solutions for fleets of all sizes. Set a geofence boundary around key locations such as a school zone, operations area, and get alerts when your vehicles exit and enter the boundary. You can even set a boundaries within a boundary! Track vehicle maintenance to easily generate alerts, and improve vehicle maintenance and lower vehicle down-time with real time engine fault code alarms. Monitor your drivers for sudden braking, sudden acceleration, sharp lane swerve, hard turning, and speeding. Enabling you to identify and train reckless drivers and improve your overall fleet safety. Lower dangerous speeding events by gaining real-time visibility into your drivers real speed vs posted speed limits. Set up boundaries around specific geographical areas such as your company yard or operational jurisdiction locations and be notified when your vehicles enter and exit a boundary. You can even set a boundary within a boundary! Meet the DOT Mandate for ELD with the industry's easiest to use, all-in-one compliance solution. Make real-time temperature monitoring simple and easy with our robust hardware solutions, lower spoilage related costs and meet FSMA compliance. Increase driver productivity, lower cellular costs and make ELD compliance more affordable with in-cabin WiFi. Gain complete visibility and streamline the DVIR process for your drivers with paperless vehicle inspections, saving paperwork and increasing productivity by a better and more productive management. Seamlessly create or import an unlimited number of landmarks for customer locations, employees addresses, and any other frequently visited locations. Landmarks increase productivity by making it easier for you to dispatch, set up more efficient routes, quickly locate the nearest vehicle for a job, and more. Fleet.Net makes filing your quarterly Fuel Tax filings a breeze. Automatically track mileage for each vehicle per state, with breakdown of toll road usage, and fuel purchased in each state. Schedule periodic maintenance such as oil change, filter change, tire check, or any other maintenance task and be notified when a particular vehicle is getting close to the scheduled task. Track excessive idling, keep your vehicles in better shape and reduce fuel costs. Monitor in real-time and produce comprehensive reports of the tire pressure throughout your fleet, improving your overall fleet and vehicle safety. Real-time vehicle tracking and play-back your vehicles route history in a breadcrumb trail. Gain real-time visibility to the current status of your PTO, and produce comprehensive reports of PTO usage. Easily meet your organizational needs by setting up different group levels for different security levels and dispatch areas. Monitor and track all of your assets to improve safety, security and utilization. Multi-language and worldwide time-zone support. Track fueling events and even have your drivers scan their fuel receipts. Improve the speed and efficiency of your organisation with robust API’s. 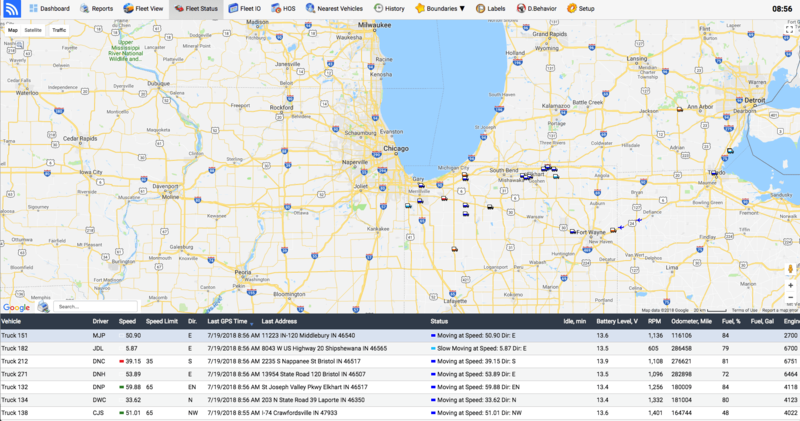 Our gps tracking devices with api support make it easy for you to get reports data, make changes to your fleet on the fly, integrate with other enterprise systems or even build custom dashboards.